The University of the Philippines College of Music through a grant from the National Research Council of the Philippines invites the public to the screening of Dr. José S. Buenconsejo's documentary film SEVEN DANCES OF LIFE: Pledges to Others (Janji) in Two Sama Communities in Tawi-Tawi Islands, Southern Philippines. This will be on Friday, 16 June 2017, 5:00-7:00 p.m. at the Abelardo Hall Auditorium, UP Diliman, Quezon City. 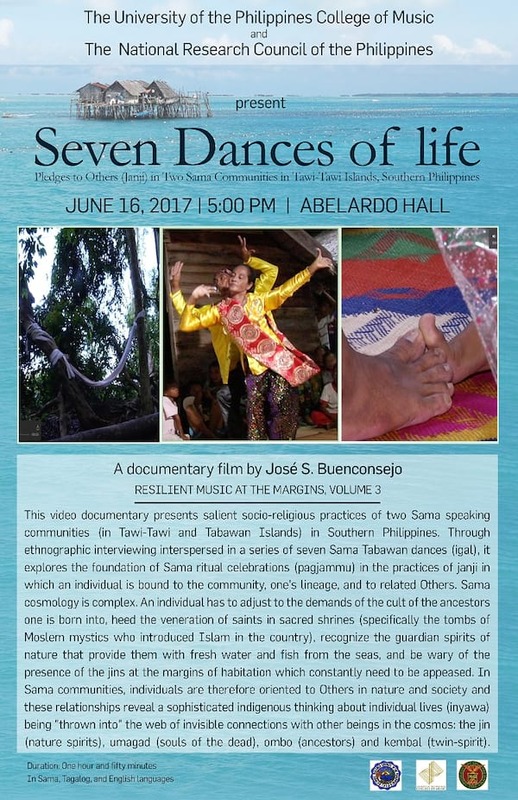 This video documentary is the third volume in the project "Resilient Music at the Margins," which aims to document enduring traditional Philippine music and dance in their cultural and historical contexts. heed the veneration of saints in sacred shrines (specifically the tombs of Moslem mystics who introduced Islam in the country), recognize the guardian spirits of nature that provide them with fresh water and fish from the seas, and be wary of the presence of the jins at the margins of habitation which constantly need to be appeased. In Sama communities, individuals are therefore oriented to Others in nature and society and these relationships reveal a sophisticated indigenous thinking about individual lives (inyawa) being "thrown into" the web of invisible connections with other beings in the cosmos: the jin (nature spirits), umagad (souls of the dead), ombo (ancestors) and kembal (twin-spirit). Bata, Bata , Malaya Ka Ba?